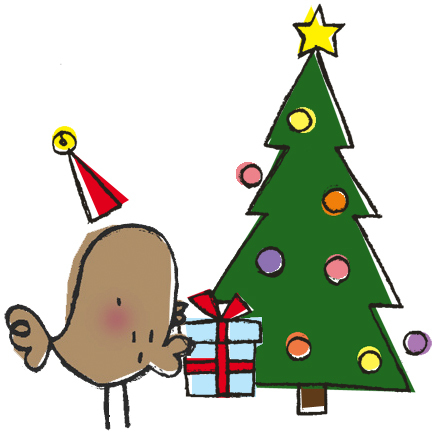 Wishing everyone a very merry Christmas, Kwanzaa, Solstice, Hanukkah, Festivus, Yule, Saturnalia or which ever holiday you wish to celebrate! 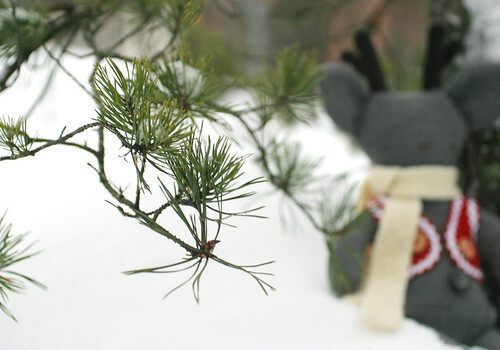 I trudged through knee deep snow to take photos of my Christmas Rag Pet today, but unfortunately my camera's battery didn't much like the cold and it up and died after just a few photos. Also, a little snow -or sleet, to be more exact- storm hit about the same time the battery popped it's clogs, so I decided that it's best to trudge back home from the forest and go back for more photos when the weather is better and the battery fully charged again. So, Rudolf the rag-reindeer is still waiting to have a proper photo shoot, but I thought I'd post the few photos I did get of him today any way, since he is my Christmas Rag Pet, and with Christmas Eve just a day away, he deserves to make his introductions in time for it. Rudolf, or Rudy as his friends call him, is an ace at orienteering. He's got a very keen sense of direction and he's really good at reading maps. 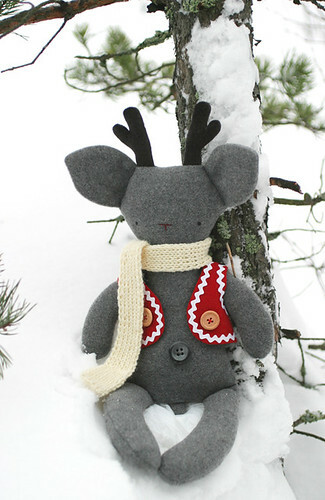 He's made out of soft grey wool and his handsome antlers are made out of dark grey velvet. He has a lovely little tail too, but I didn't get a photo of it this time round. 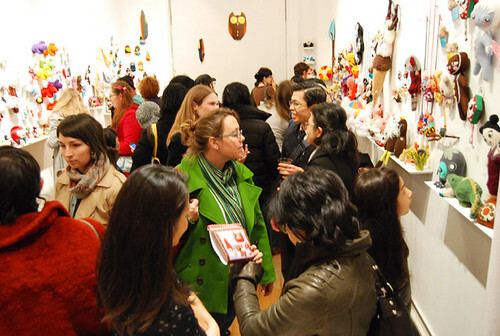 The Luv-able + Hug-able show opened a week ago at Gallery Hanahou in New York and apparently the opening party was a bast! Lots of people turned up to see the exhibition, and it looks like the place was packed to the rafters with people and plushies. 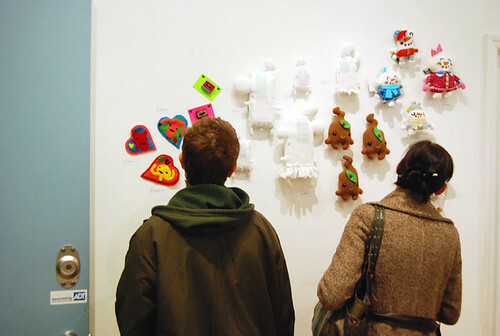 I'm greatly amused that my rag-snowflakes are hanging out at the gallery next to guts and poop -very cute internal organ brooches by I Heart Guts and super adorable Pocket Poops by Anna Chambers- and some more snow, in the form of happy Snow Angels by Leeanna Butcher. Snowflake no. 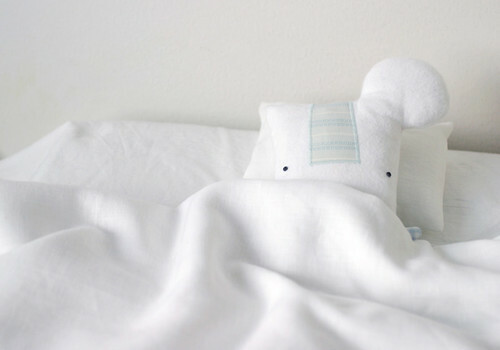 4 sold on opening night, and I'm really chuffed that he's going home to Mochimochi Land, since I'm a fan of Anna Hrachovec's knitted critters and it's really neat that she bought one of my snowflakes. Pieces from the show are available to buy online now, through Junie Moon/Gallery LeLe. 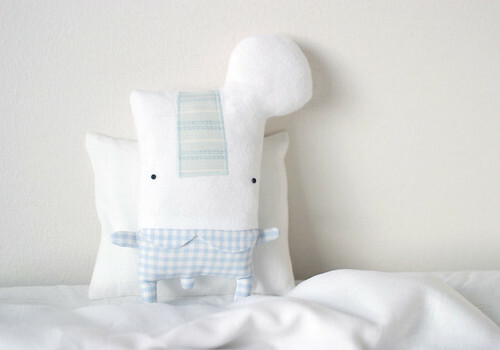 There's still loads of great plushes waiting for new homes, so go nab yours now, they're going quick! 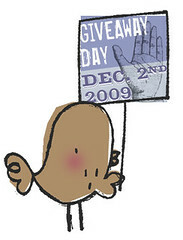 Without further ado, I'd like to announce that the winner of my giveaway is lucky number 74! 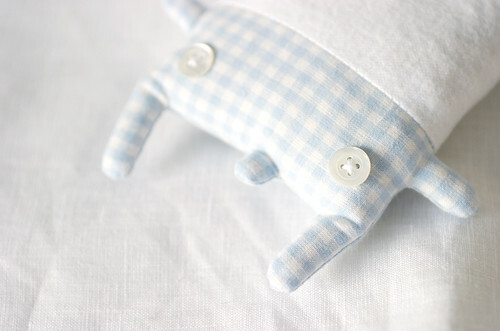 Yay, congratulations Wendy of I Love Baby Quilts, I'm sure Flakey will be very happy with you in Texas. I'm going to start preparing for some Independence Day celebrations consisting of yummy food, good company and watching the president's Independence Day reception on telly (I like to look at all the gorgeous -and not so gorgeous- gowns the guests are wearing) now, and I'd like to wish the many, many, many of you that visited my blog these past few days for Giveaway Day, and otherwise too, very happy holidays!